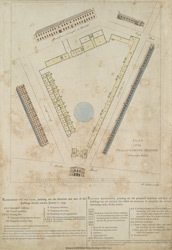 Plan of the buildings of the Philanthropic Reform (or Society), with title at bottom right, scale bar at bottom, and key in a panel below the plan. The facade and the wings of the building are shown in elevation. The Society was founded in 1788 for the prevention of crime among underprivileged children through education and training. Based in St George's Fields, the Society was able to receive up to 200 youths of both sexes.